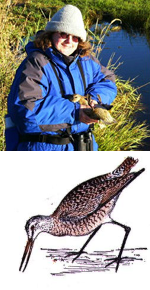 This outings program takes us on outings organized as part of the Godwit Days Spring Migration Bird Festival in Arcata, California. Arcata can claim to be one of the top birding locations in the country. In this part, Steve continues on a hike in the Headwaters Forest Reserve in a quest to see a particularly difficult to find, endangered wild bird, the marbled murrelet. Dave Anthon and Julie Clark from the Bureau of Land Management led the hike. 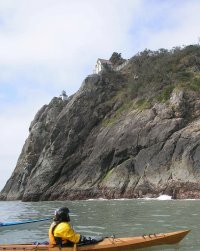 Now in an obsessive persuit of the marbled murrelet, Steve joins a sea kayaking tour in Trinidad Bay lead by guides from Kayak Zaks. In part 2, Steve continues on the hike and goes on another outing determined to see the bird. This skills program is part two of an interview with John Vonhof, the author of Fixing Your Feet. Your feet are your main means of transportation on most wilderness adventures. Some people suffer after a relatively short distance, while others have walked thousands of miles without problems. So how do you keep your feet in top working order? John explains how to manage hot spots before blisters appear on your feet. In case that fails, he goes into quite a bit of detail about how to treat blisters after they appear. He talks about the article he wrote for Backpackinglight magazine about his 1.5 ounce foot care kit. He talks about people who have been very successful at walking thousands of miles without foot problems, and talks about a forthcoming update of his book. If you want to know more, John publishes the Fixing Your Feet E-zine, and maintains the Happy Feet weblog. This skills program is part one of an interview with John Vonhof, the author of Fixing Your Feet. Your feet are your main means of transportation on most wilderness adventures. Some people suffer after a relatively short distance, while others have walked thousands of miles without problems. So how do you keep your feet in top working order? John talks about what motivated him to write his book. He talks about how to choose and fit your shoes properly, how to tell if a shoe is going to cause you problems. He talks about some of the foot problems you can prevent from the start. In next week's edition, John will talk more about fixing particular problems you might have with your feet. This skills program is an introduction to birdwatching. The wildlife you're most likely to see on any wilderness outing are birds, and they're certainly more interesting if you can tell them apart. In this edition, we hear from Shana Stearn of BirderBabes.com. Shana taught Birdwatching 101 at the Godwit Days Spring Migration Bird Festival in Arcata, California. Arcata can claim to be one of the top birding locations in the country. Shana talks about her Seven S's of bird identification: Shade, shape, silhouette, signs, sounds, sweep, and surroundings. She explains the gear you need to get started, and some other tips for beginning birdwatchers. Shana's web site, BirderBabes.com has large collection of bird watching reference information. This wild places program explores an alternative to the Pacific Crest Trail (PCT), a 1,300 mile route called The Desert Trail. This trail runs roughly parallel to the PCT, through the high desert of California, Nevada, and Oregon, and is eventually planned to continue through Idaho and Montana. Ross Edgington of The Desert Trail Association talks about the history of the trail, the development of the route in Oregon, and the current progress toward the trail's completion. Steve Tabor of The Desert Survivors talks about the development of the California and Nevada sections. He describes their 2005 relay hike of the entire trail. He contemplates the prospects of someone doing a through hike of the trail. Maps and guides for The Desert Trail are available for the sections that are already established. The Desert Trail Association sells maps and guides for the Oregon section. 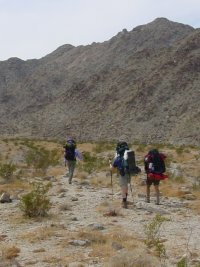 The Desert Survivors sell guide and map books for the California and Nevada sections. Both organizations are looking for volunteers to support their efforts to complete the trail. Now that the rain has subsided in Northern California, we're ready to wrap up our desert features for the season. 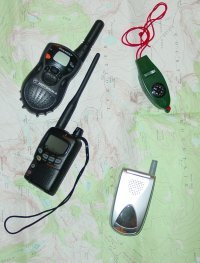 This skills program is an overview of some of the ways you can call for help from the wilderness. Have you ever thought about how you'd get help if you needed it? Out of all the different ways you could let somebody know about your situation, some of them work better than others. Steve talks about simple signaling techniques, like whistles, signal mirrors, and smoke signals, and then discusses various phones and radio technologies. He talks to Caroline Semerdjian at Sprint-Nextel. She mentions a page to find out their network coverage by zip-code. We replay a comment by Sgt. Phil Caporale of the Fresno County Sheriff's search and rescue unit from A Winter Storm Warning (our editions #15 & #16), where he talks about problems with satellite phones. Steve talks to Bill Jeffrey about amateur (or "ham") radio. Bill created and maintains a web site called the Pacific Crest Trail Repeater Guide. Bill talks about a time when amateur radio communications saved him from a difficult situation in Kings Canyon National Park. This outings program completes our report of our trip with the Desert Survivors. 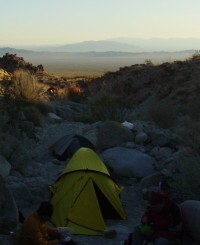 We camped for two nights in the Sheep Hole Valley Wilderness, in the southern Mojave desert. In this part, leader Dave Halligan leads Steve and the group to the top of the Sheep Hole Mountains, and back out the next day. The show ends with a conversation on the hike-out about the desert experience. This outings program takes us on a backpacking trip with The Desert Survivors. We camped for two nights in the Sheep Hole Valley Wilderness, in the southern Mojave Desert. In this part, leader Dave Halligan leads Steve and his group into a camp site and begins a peak climb the next day. In part two, you'll hear the rest of the outing report. 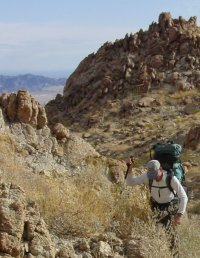 This skills program is an introduction to desert backpacking skills. Steve talks to Steve Tabor of the Berkeley, California based group, The Desert Survivors. Steve Tabor dispels some of the fears people have about desert wilderness travel. He shares his considerable experience about gear, water management, and plants and animals in the desert. We'll hear more from Steve Tabor in a future program. 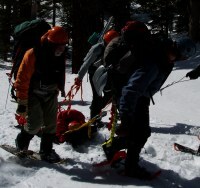 If you're curious about technical mountain rescue, take a look at the Mountain Rescue Association (MRA). Their Team Information page lists all of their affiliated teams. If you're not in a mountainous area or are curious about less technical search and rescue teams, take a look at the National Association for Search and Rescue (NASAR). Many of their affiliated units are listed on their Links page. In our edition #16, there's an interview with Sergeant Phil Caporale of the Fresno Country Sheriff's search and rescue unit. He gives some additional advice on being better prepared in case you ever need to be rescued. This gear program is a report on the Winter 2006 Outdoor Retailer's Expo. Jerry Goller, Rebecca Sowards-Emmerd, and Steven Nelson of Backpack Gear Test report on the show in general, and the gear they saw there in particular. They commented on gear made by Heat Factory, Jetboil, Arc'teryx, Osprey, Mountain Hardware, Pacific Outdoor Equipment, Kahtoola, Java Juice, Ursack, Icebreaker Merino, and Injinji. This skills program is a mini wilderness first aid class. Bobbie Foster of Foster Calm is a wilderness EMT and professional first aid trainer. She talks us through the most common health problems people encounter on backcountry trips, and what to do about them. She explains the different levels of wilderness first-aid training of interest to non-medical professionals. 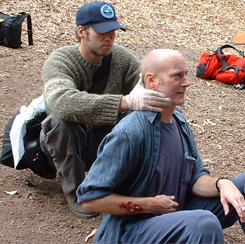 Standards for wilderness first aid courses is established by the Wilderness Medical Society. To find wilderness first aid training near you, look for wilderness first aid or wilderness first responder using your favorite search engine. Although there are a lot of good books on wilderness first aid, the most up-to-date volume we know about for non-professional users is Wilderness 911 by Eric Weiss, M.D. This skills program is an introduction to avalanche safety. 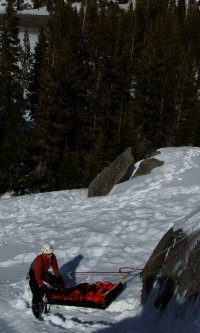 Gary Bard, an avalanche safety instructor for Mountain Adventure Seminars, talks about easy ways to stay out of avalanches, and describes a rescue. Brandon Schwartz of the Sierra Avalanche Center talks about avalanche forecasting and the Snow Condition Report. Tom Murphy, of the American Institute for Avalanche Research and Education (AIARE), talks about avalanche safety education. 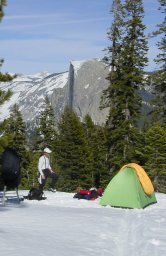 This skills program is an introduction to snow camping by Mike Clelland. Mike is a winter camping instructor for the National Outdoor Leadership School. 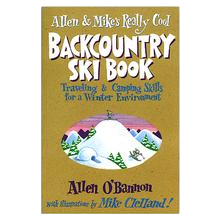 He's also the illustrator and co-author of Allen & Mike's Really Cool Backcountry Ski Book. In this part, Mike talks about kitchens, cooking and nutrition, and staying warm at night. Ben Lawhon from the Leave No Trace Center gives some additional tips for low-impact snow camping. In this part, Mike talks about clothing, camp site selection, and shelter. Next week in part two, he'll tell you the rest you need to know to get started. 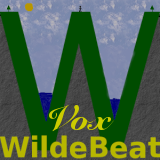 This is an introduction to Vox WildeBeat, a new companion podcast feed that's all about your participation. After you listen to what it's about, it's your turn to talk!